OTONEWS - Fuji Heavy Industries Ltd., a Japanese manufacturer Subaru car maker, presenting a concept sports car Subaru STI most powerful in the event the New York Auto Show 2015. The presentation of the concept was not just a show of technological excellence but also as a marker of a new strategy Subaru in America. The presence of a concept that signifies expansion plans Subaru's three core businesses. All three are after-market parts, car intact, as well as motor sport. "Display technology and components Subaru Tecnica International Inc. (STI), including STI suspension, additional brake, as well as the exterior. This is to signify the commitment STI for sports cars, "said Subaru. This concept uses emppat STI EJ20 engine cylinder 2,000 cc which is currently used for car Subaru GT in the match racing in Japan. In May 2014 ago, Fuji Heavy announced its medium-term management vision. Business management, titled Vision 2020 Prominence aims to achieve sustainable growth of the company. Based on this vision, Fuji Heavy Industries 2020 establishes the company's vision, which is to be a company that is not only large in size but has a distinctive kekekuatan. To that end, FHI focused on two activities that strengthen the Subaru brand image and build a strong business structure. His form, Fujui also expanded value-added business, and increase tolerance to changes in the business environment. 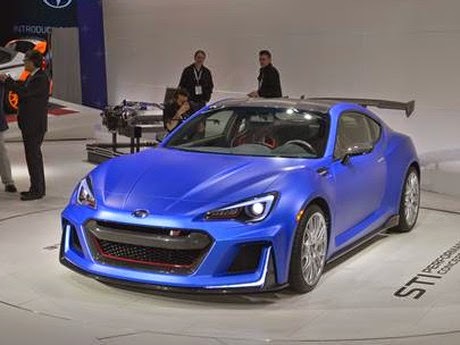 Long story short, diboyongnya concept of high-performance Subaru STI to the mat New York Auto Show is one of the start of the initiative in the United States. In the largest market Subaru, FHI will also expand market aftermarket components STI. No Comment "Subaru STI Most fierce Present in New York"